We have a furry addition to our family – a female black cat that we adopted yesterday from the local animal shelter. We’ve had a bad run with pets over the last few years but, ever hopeful, we’re giving cat ownership another go. Which leads us todays post, because of course our new furry friend needs a name. In this case we decided on Blackie. I know it doesn’t win awards for originality. Thank goodness animals are the only ones to get names based on their appearance, other wise both my boys would be named Scrawny Pink Thing. Names are a funny thing. When I was teaching I came to associate a certain type of kid with their name, thus I’ve never met a Lewis who wasn’t lovely while I have a weird aversion to boys with J names (thank you, all you Jakes, Jordans, Jacksons and Joshs). Of course some of the ‘J’ brigade were lovely, but it’s the little…well, you know, that stand out. As far as characters go, I struggle to name them. My protagonist in Child of War is Jedda, a name that I hoped was strong and not too main stream – but not too out there. It’s a j-name obviously but he and I get along pretty well. And while they may seem superficial, the names characters have help to form a picture in our mind, they both draw on and add to our previous experience to create meaning. After all, would we picture Shakespeare’s Juliet the same if she were called Ursula? Romeo and Ursula? Or would we now imagine all girls called Ursula differently? I knew a couple who named their new baby daughter Ursula – my immediate mental image was not flattering. If you were being set up on a blind date with a man called Homer, would you picture a distinguished Greek poet or a jaundiced over-weight family man? Do you have any favourite character names? How important are names to you? Writing Through the Fog…Or Not. Heard the saying, “the best laid plans of mice and men…”? It’s a beautiful phrase from a beautiful but (I think) a profoundly sad poem by Robert Burns. We’re all like the little mouse, doing our best to prepare and plan for what is to come, not realising that very soon our plans could be changed drastically (although I hope that your and my plans don’t go as awry as the poor little mouse’s). My plan was to send my completed novel ‘Child of War’ out into the world and, while I waited for someone to realise that they just had to publish it, finish the first draft of my current novel in four months. Enter some health concerns, medication changes and a general feeling of ‘humpf’ and I find that I haven’t written for weeks. So much for completing my first draft by the end of this month. So, I’m curious (and a little desperate) how do you shift your mood when you’re feeling a bit ‘beige’ and your plans have been ploughed up? Most of us do although there may be different contexts. An accident, a flaring temper, fear, excitement, a few drinks – these things can make even the most mild mannered person drop a four letter word. The company we find ourselves in can also influence our choice of language. I would never swear in front of my grandma or my children, I would only swear in front of my parents if no other word could convey the feeling I wanted to get across. I swear pretty freely with my friends and they with me. When I meet up with friends who are also mums, and without the children, we use language that could shock … well probably no one would be particularly shocked these days but still, it’s pretty bad. I suspect it’s a relief valve, we’re so careful around the terrors darlings that when they’re not around we can let fly. And, of course, teenagers swear – probably for the same reason as the mothers of young children. I have yet to meet a teenager (and in a past life I was a high school teacher) that doesn’t swear amongst their peers, even if it’s only occasionally. And so, here’s the question – should there be swearing in books aimed at young adults? When your seventeen year old protagonist is running from murderous thugs, is it acceptable for him to drop a few dirty words? Or is swearing in young adult fiction a no go? And if it is, what do you replace it with? I would love to hear what you think. 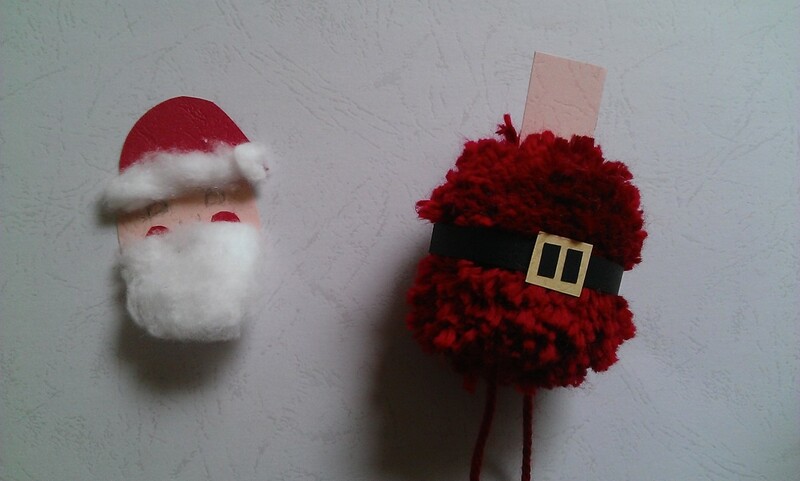 Christmas Craft – Pom Pom Santa. I love Christmas. I scoff at the suggestion that, ‘Christmas is really for kids.” Firstly because I’m Christian and, for me, Christmas is about more than just celebrating time with family and friends (although that’s wonderful too) and secondly because, while my children bring something new and special to Christmas for me now, I still have the same excitement and sense of wonder about Christmas that I had when I was a child. Also, if Christmas is really just for kids, how do you explain the lashings of port, brandy or rum that can be found in just about everything? From the mince tarts, to the Christmas pudding to the glaze for the ham? 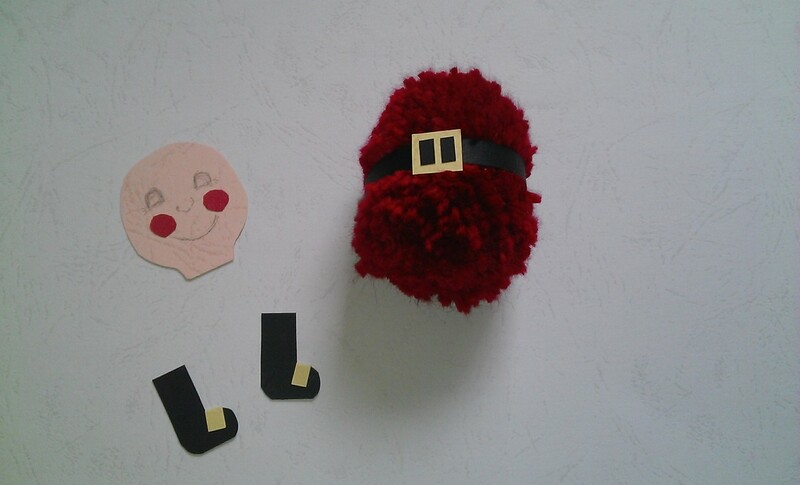 Anyway, this leads us to a kid-friendly Christmas craft (and the first kid activity to be posted on this blog). 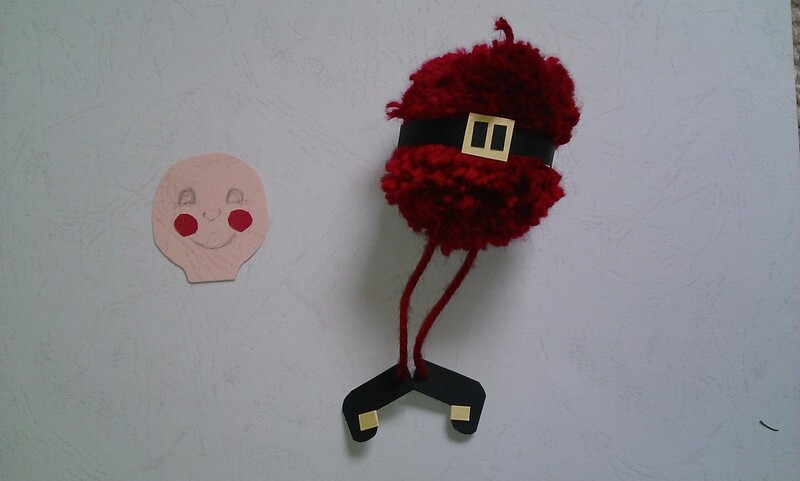 1) Make a pom pom. This is fairly simple to do – cut out two discs from an empty cereal box. Tracing around the top of a egg cup will give you the perfect size. Poke a hole in the middle of each disk and cut a hole in the middle that is big enough for you to pass the wool through. Hold the cardboard rings together, hold the end of your wool to the disk, pass the rest of the wool underneath the rings and through the hole. Cross over the end that you’re holding, pass the wool under the discs again and through the hole, and pull it tight to anchor the end of your wool in place. Continue this until the disks are completely covered in wool and you can no longer pass your wool through the hole in the centre. Anchor the end of your wool by passing it under some of the tight strands. 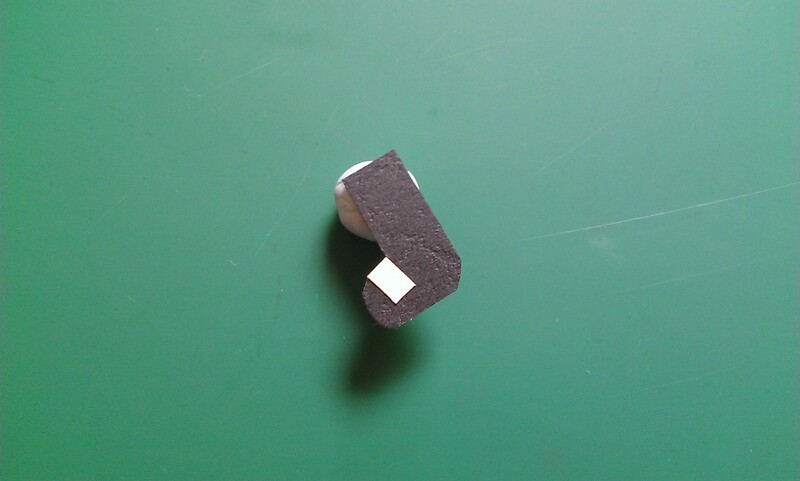 Using a pair of sharp scissors, work the point of the scissors through the wool and between the two discs. Cut the wool all the way around but do not remove the disks yet. 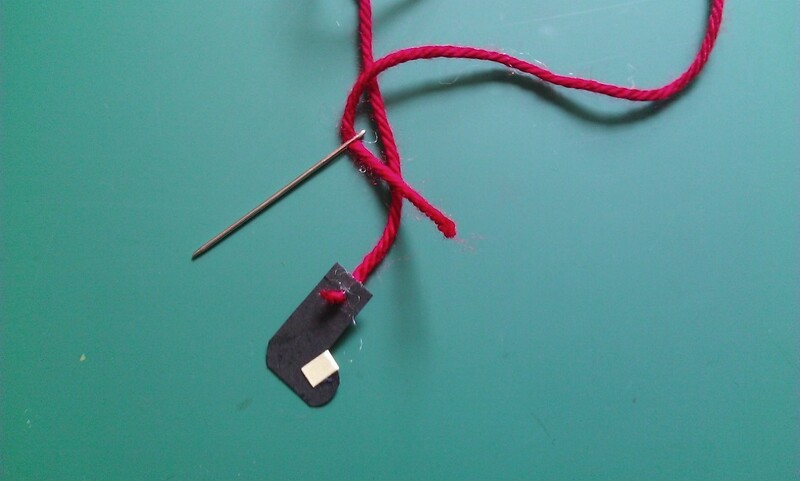 Pass a strand of wool between the rings and make a tight knot then remove the disks. And there you go, one pom pom. Now on to making your Santa. From your coloured paper cut out one face shape, one semi-circle (hat), one long rectangle (belt), two boot shapes, two glove shapes, two small pink circles (cheeks), one small yellow square (belt buckle), two small black rectangles and two small yellow rectangles. The age of your child will dictate whether you cut all the shapes out and they do the gluing, or they do it all. My son is three and a half. He love scissors *shudder* but he’s not capable of cutting out shapes like the ones above. 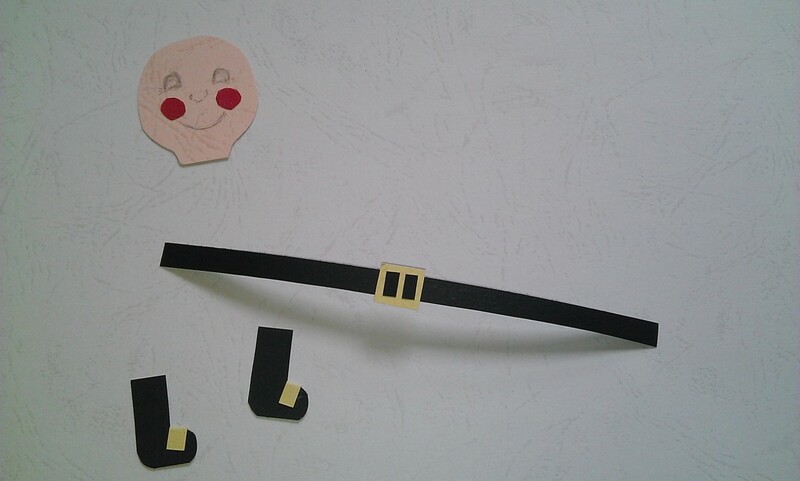 Start constructing the parts of your Santa. 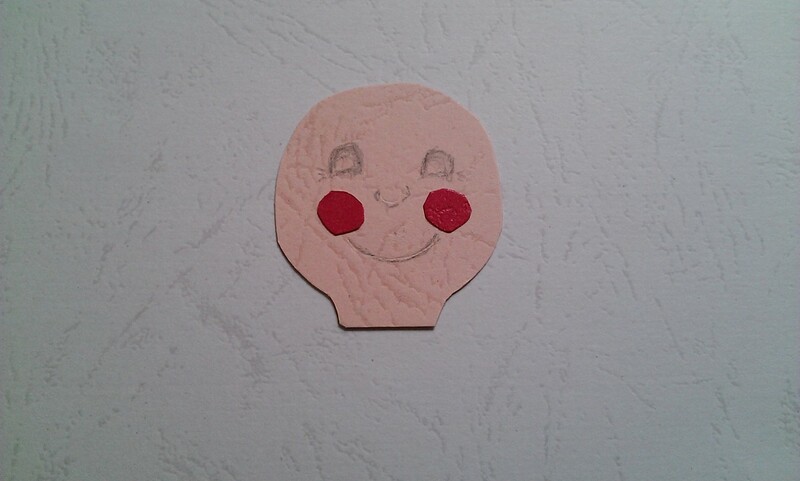 Stick the rosy cheeks onto the face and pencil in the eyes, nose and mouth. 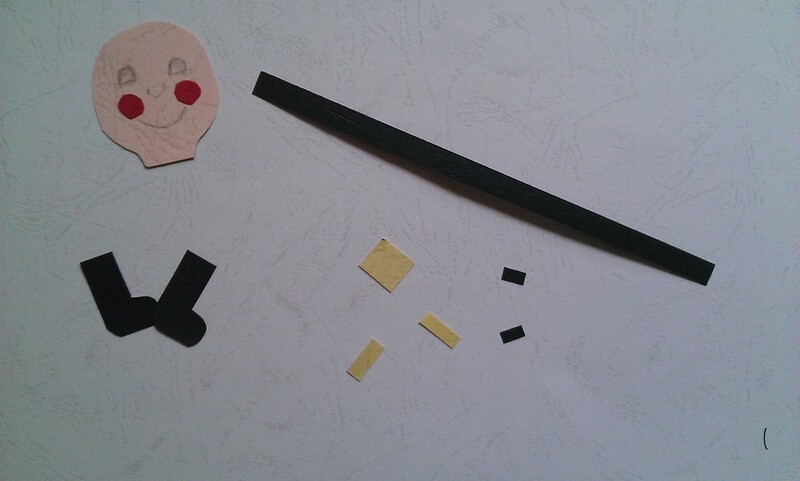 Glue the yellow square to the middle of the long black rectangle and then glue the two small black rectangles on top. Fold the small yellow rectangles in half and glue to the top of each boot. 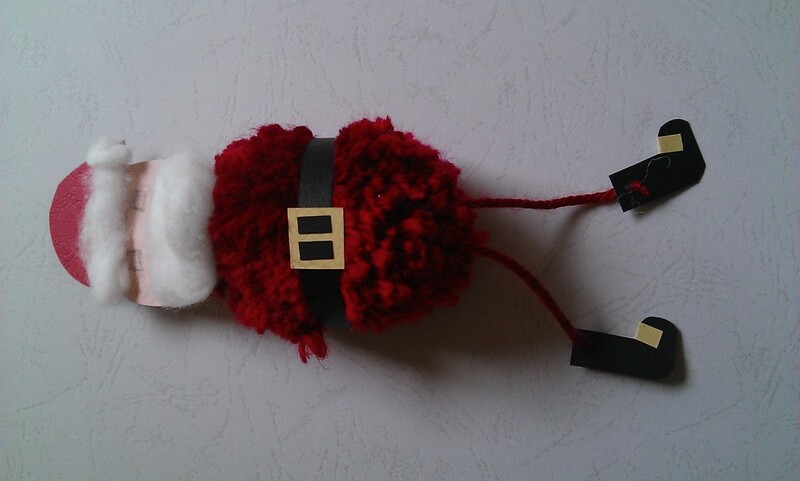 Wrap the belt around the middle of the pom pom and glue the ends together. Put one of the boots on the blue tac and punch a hole in the top of the boot with a sharp pencil. Repeat with the other boot. Run a piece of wool though the hole, tying it off with a knot. 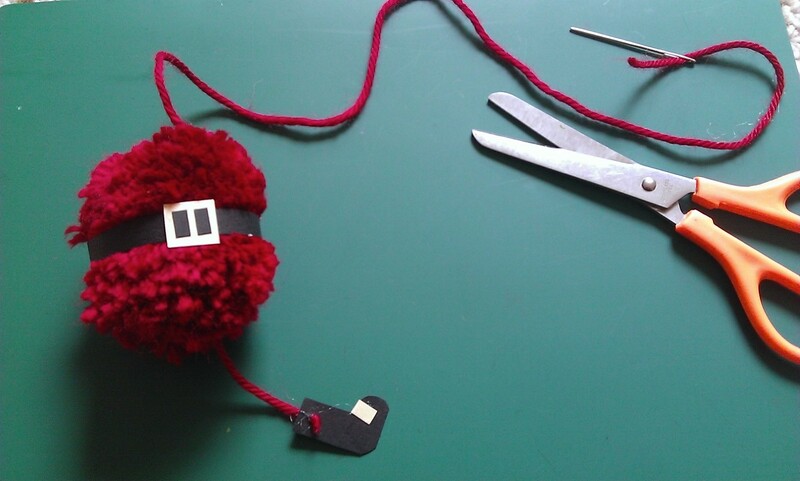 Using the knitter’s needle, pass the piece of wool up through the pom pom. When you’re happy with the length of the leg, tie a knot in the top and trim the strand of wool. Repeat with the other boot. 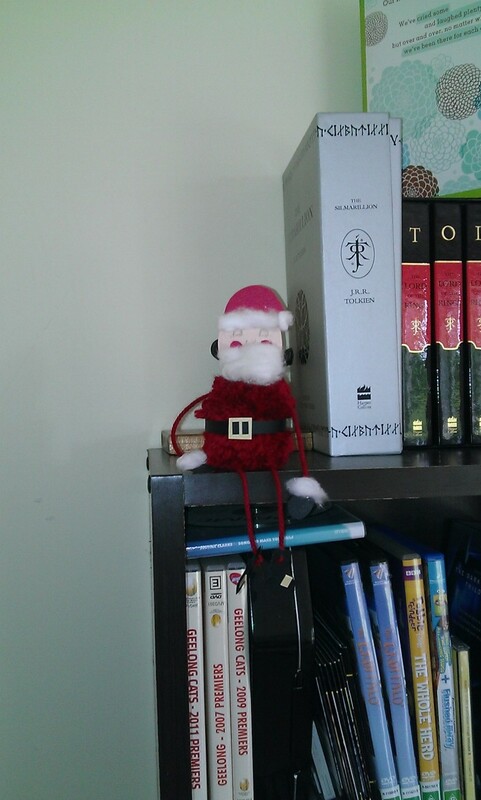 Ooooo, look, Santa has legs…and a weird…disembodied head. 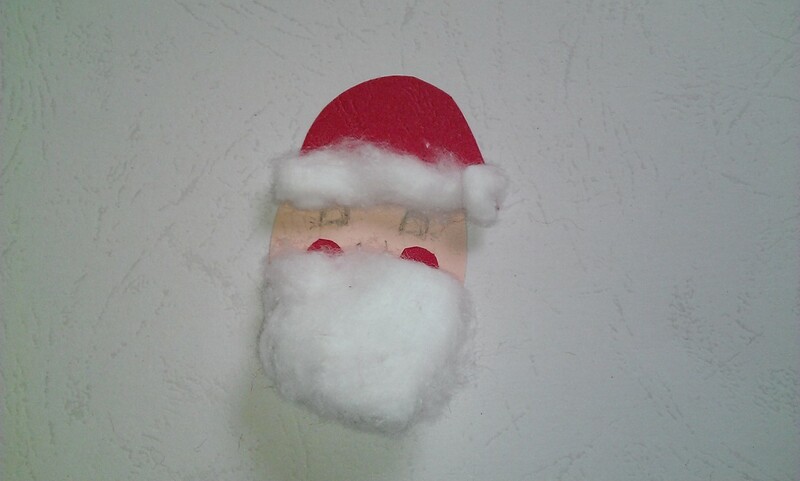 Glue the hat to the head and add a beard and the fur on the edge of Santa’s hat. 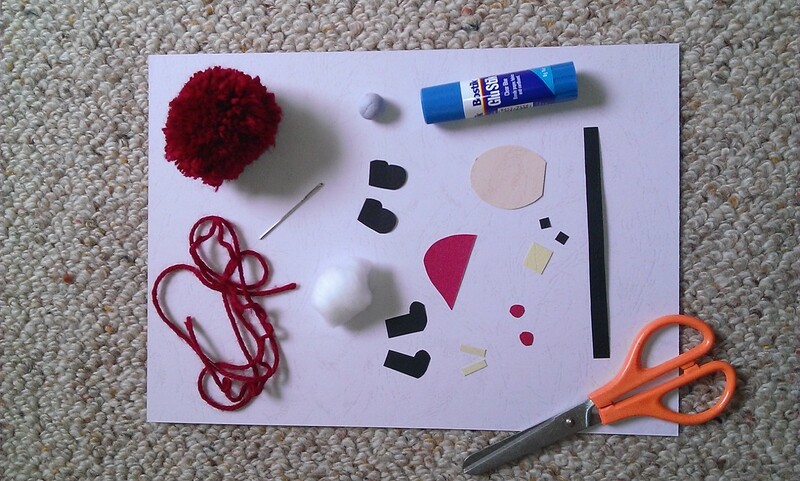 Glue a rectangle of card into the top of the pom pom. You might have to squeeze for a little bit to make sure it’s properly stuck. This will be what you stick your head onto so, to avoid freaked out kids, make sure it’s well stuck. Attach the hands and arms in the same way you did the legs except use only one strand of wool. Attach the hand to one end, pass the wool through the pom pom and attach the remaining hand to the other end and tie off. Add cotton wool to the tops of the gloves. And there you go. Trace over the eyes you pencilled in earlier with a black pen. 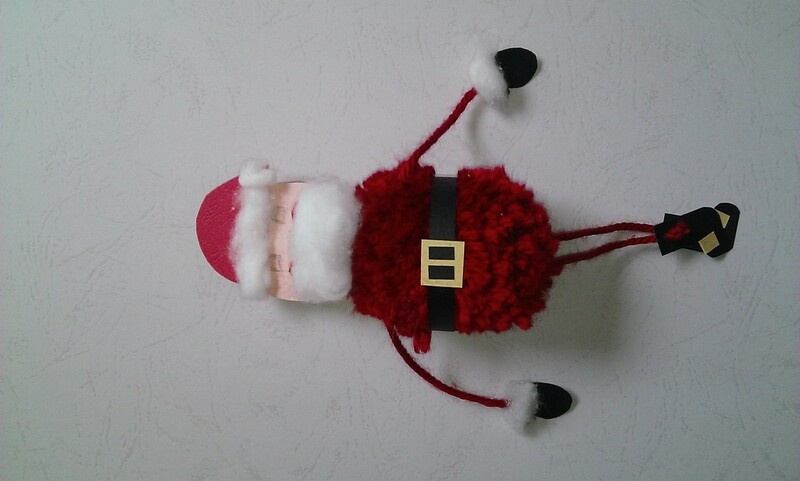 This little guy takes about an hour to put together, if you’ve got the pom pom already made. If you don’t celebrate Christmas or you don’t have the time to do this activity right now (maybe you’re busy for some reason…is there some big event coming up soon that might have you stressing out a tad?) then it can be varied in many ways. What about a pink pom pom made into a pig? A black pom pom turned into a bat? I’d love to hear your ideas for variations and I’d really love to see your kids creations.